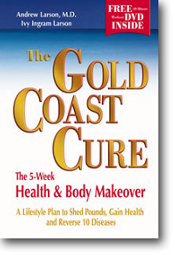 "The Gold Coast Cure - The 5-Week Health & Body Makeover - A Lifestyle Plan to Shed Pounds, Gain Health and Reverse 10 Diseases" is a book by Ivy and Andrew Larson, a husband a wife team. Ivy was diagnosed with multiple sclerosis when she was 22 years old. A newlywed, she was not ready to hear that she had a disease like MS.
Would I ever be able to have children? Would I always need to wear a catheter? Was I going to end up in a wheelchair?" The Gold Coast Cure came about when her doctor gave her two choices - she could begin one of the medications used to treat MS at the time. Or she could try the Dr. Swank diet for multiple sclerosis. She chose the diet. It helped, but it was bland and hard to follow. So she began doing her own research. Even though her husband, a medical student at the time, was skeptical, he soon joined in. Fast forward to now, they have developed a program that works - "The Gold Coast Cure". All of her symptoms have gone into remission. She is able to run on the beach with her little boy, (yes, she had her child). And now they teach others how to do the same, in 5-weeks.The Gold Coast Cure program is for you if you have multiple sclerosis, obesity, heart artery disease, type II diabetes, asthma, allergies, osteoarthritis, fibromyalgia, osteoporosis, vascular dementia, high blood pressure, or high cholesterol. It's a complete program including over 75 recipes, a complete pantry makeover, brand-name shopping guide, a daily vitamin planner, and a 30 minute workout DVD. All with the intention of reversing or eliminating the above degenerative diseases. After reading through the book, we already do many of the things she suggests. It wouldn't be that much of a stress to go all the way. We're always looking for ways to eat better. Some of the exercises in The Gold Coast Cure aren't very practical for someone with more advanced MS symptoms like severe imbalance. My thoughts are that if you can do any type of exercise at your particular level of disability, then you're sure to get some benefit. The benefits may be a little slower in coming, but you will get there. And talk about good timing. I just received an email from the Larsons today promoting their newest cookbook - "Wholefoods Diet Cookbook" - Here is the entire email. Andy and I wanted to let you all know our third book Whole Foods Diet Cookbook: 200 Recipes for Optimal Health will be officially released June 1st. The book is currently available on www.Amazon.com and will be in bookstores and select Costco stores nationwide next week. Brunch Munchies such as Crepes with Strawberry Filling, Individual Baked Omelet Soufflés with Leeks and Mushrooms, Baked Whole-Grain Millet and Lemon Custard Cups, etc. One Dish Chic one-dish meals such as Slow Cooker Fiery Cajun Creole with Seafood Trio, Volcano Ahi Tuna Rolls, Tofu Cubes in Spicy Tomato-Orange Garlic Sauce, etc. Weeknight Dinners featuring complete menus for easy everyday meals such as White Bean-Butternut Squash Ragout over Polenta Squares. Company is Coming featuring complete menus for effortless entertaining such as Shrimp Kabobs with Vodka-Lime Marinade and Curried Butternut Squash Soup. Making it on Occasion featuring "whole foods" menus for 4th of July, Super Bowl, Thanksgiving, etc. Wine Flight & Taste of the World Appetizers such as "Passport to Italy" featuring Mini Quinoa Pizzas, Sicilian-Style Crab Cakes, Bite-Sized Spinach and Mozzarella Frittatas and wine flight suggestions. Almost Guilt-Free Treats such as Refrigerator Almond Butter Pie with Chocolate Crust, Sweet and Savory Frozen Vanilla Peach Custard, Warm Pistachio Pudding, etc. 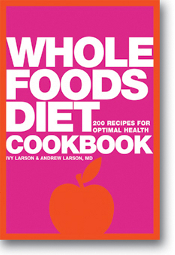 UPDATE: More information on the Whole Foods Diet Cookbook, including recipe photos, is on our updated website at www.cleancuisineandmore.com. We are very excited as we are getting a great deal of preliminary media interest in the book so far! I have appointments in NYC next week with Food & Wine, First for Women, Good Housekeeping, Family Circle, Ladies Home Journal, Natural Health, People Magazine, Today Show, Fox & Friends, etc. We will also be on the June/ July cover of Healthy Living magazine and featured in Better Nutrition, www.diet.com, the Palm Beach Post, etc. The media coverage is always a huge help, but we also need the support of family and friends. Please help spread the word and forward this email on to anyone you think might be interested. Also, for those of you who live in Palm Beach County, we are planning several upcoming book launch events....stay tuned! Authors of Amazon.com #1 Best-selling The Gold Coast Cure, Gold Coast Cure’s Fitter, Firmer, Faster Program and Whole Foods Diet Cookbook. If you are able, why not try it. Although it's a pretty simple program, it may be hard to change from a way of life you've been used to. Most people would love to try something that promotes a healthier way of living and with it possibly way to reduce, if not eliminate their symptoms. Whether or not you believe it's a cure, well you'll have to try The Gold Coast Cure for yourself. If it helps you, come back and recommend it. If not, well at least you'll get some great recipes and perhaps you'll even be a little healthier.